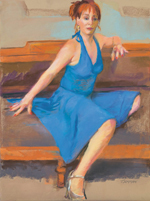 This painting was created using a live model. I began with a sketchy under-painting in charcoal. Then I worked in color with pastel medium on the lighted aspects of the face. After adding color to the bust and the hat, I was surprised to find that the painting just worked! 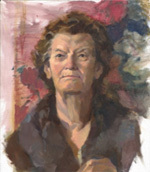 The shadow surface of the face was left untouched, exposing the raw under-painting. 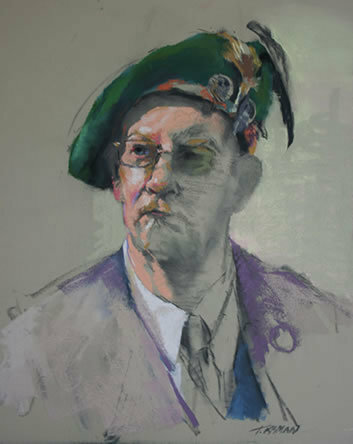 "Scottish Hat" is a perfect example of the painting telling the painter when it is finished, and not the other way around. 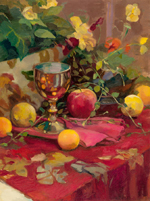 Merit Award: Pastel Society of New Hampshire, "It's Pastel"
The painting won 1st Place in Pastels in Art Buzz International Competition 2012. 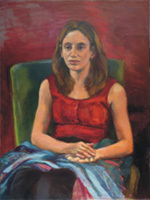 As a result, it was featured in the hard cover publication "Art Buzz : The 2012 Collection". 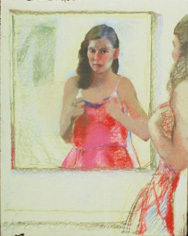 The concept of "Red Dress" was to emphasize the mirror image over the live model, to depict the insight of her self-image. 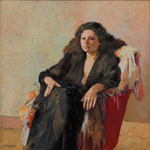 The painting is in a private collection. 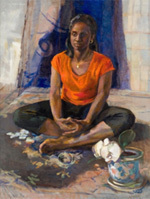 This painting was named for the cherished medal Brenda wore around her neck.